Planning for retirement can be a contentious issue – in large part because it brings up a lot of worries about both financial security and physical well-being – and this can cause people to avoid talking about the topic. Unfortunately, by keeping your plans to yourself, you could be compromising your future care and security. As most advisors will explain, though you may want to remain guarded on some of the specifics of your plan, there are some key players you should keep in the loop. Who matters when planning your retirement, and what specifics need to be laid out in advance of any major life changes? We recommend factoring these three matters into your retirement planning – you can always change the details later, but laying the groundwork is important. In some sectors, you’ll hear people say that the general rule of thumb for retirement savings is that if you calculate the amount of money you plan to spend during your first year of retirement and multiply that number by 25, then you can spend 4 percent of your savings during the first year and safely assume you’ll have enough savings to keep you afloat until you die. There are other underlying calculations that influence the 4 percent number, but if you start with the wrong amount and major unexpected costs arise, this rule won’t help you much. The unreliability of this basic rule is just one of the reasons you should consult outside experts as you plan your retirement; they’ll be able to point out estimation errors and forgotten expenses that you’ll need to factor into your savings plan. 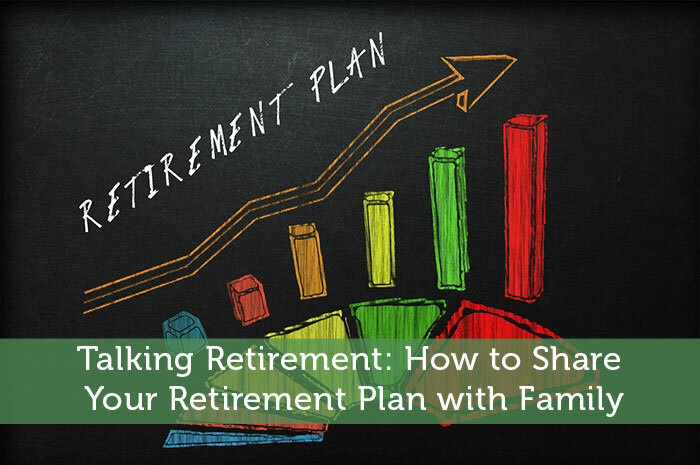 By the time you’re laying out retirement plans, your kids will likely be adults who can contribute to the conversation and discuss what they expect their own role to be down the road. For example, most adult children assume they will take some responsibility for the care of elderly parents, whether financial, physical, or both. You may not want this to be the case, however, and may even have concrete plans to take a different path, but you need to communicate this plan now in order to prevent future conflicts. One way to approach discussing retirement with your adult children is by drawing up a plan for your later years that you can present to them. Depending on what type of planner you are and how much you want to disclose, you might sit down with a general outline of your intentions or you may turn up with a presentation-ready report containing legal advance directives, contact information for your lawyer and doctor, a will, and other vital information that can help your children assist in your care as you age. As the old axiom goes, the only constant is change, and that’s as true of retired life as it is of the earlier years. As you plan your retirement savings, expect that various lifestyle changes will factor into your budget. For example, you may save by no longer commuting to work or finish paying off your mortgage. Alternatively, a change in health status may increase your medical bills or mean that you need to change your housing situation by moving or making renovations, adding to your expenses. You can’t be sure that the things you plan will remain as stable as they seem on paper. You can, of course, insulate yourself from some of these changes by purchasing long-term care insurance, which can help to cover costs if you or your spouse become very ill and require nursing care at home or in a facility, but this is only one scenario. Unfortunately, you can’t insure yourself against market fluctuations, minor emergencies and repairs, and change itself. Retirement can be one of the most enjoyable periods of your life if you plan well, but it’s also a time of great uncertainty. Build your support network – from doctors to lawyers to family members – to buoy yourself in the face of those changes. This is so true. And on the flip side, if parents DO want (or think they’ll need) their kids to take care of them in old age, they need to tell their adult children that too. Their children may have conflicts and worries about how to make this happen that can be more easily dealt with and fixed in advance, as opposed to leaving it to the last minute. For example, if one’s adult children live in another city or state, can the parent move there to make it easier for the children to help them with care? It might not be possible for the children to move to where the parents are. So many factors to consider! I am a professional wealth manager who has built businesses on 4 continents. I have counseled numerous families over more than three decades and “Expect Changes” cannot be emphasized enough. Healthcare will be a huge consideration going forward and will be impacted by longevity telescoping out. Our children will work in a truly global marketplace where skills are literally being defined every day and where traditional education has less value. I’m a true optimist and am excited for the future, but am also prepared for the inevitable jiggle. Great piece!